The primary cause of high nitrate and nuisance algae growth in aquariums stems from allowing organic debris to accumulate in the system. The problem areas in any aquarium where broken down organic matter can settle and build up is in the substrate, between live rock or decorative structures, and inside rocks with porous surfaces. It's not difficult to keep an aquarium clean and tidy. From this list of handy cleaning tools and the simple things you can include as part of your regular maintenance routine to clean up the substrate and live rocks, it's easy to reduce heavy amounts of troublesome organics that settle and build up in these areas of your aquarium. Before you start cleaning the substrate, it's important to know that if you have not cleaned it for a long time, it will undoubtedly be very dirty. DON'T clean it all at once because this can lead to new tank syndrome. The best way to begin removing a heavy amount of organic matter trapped in the substrate is to section off the bottom and only clean up a small portion of it at a time, then wait at least several days to a week before doing the next section. After finishing all the sections, if the substrate is still rather dirty, start over again. Through this process your substrate will slowly get cleaned up, and once it is under control, here's what you can do to keep it that way. 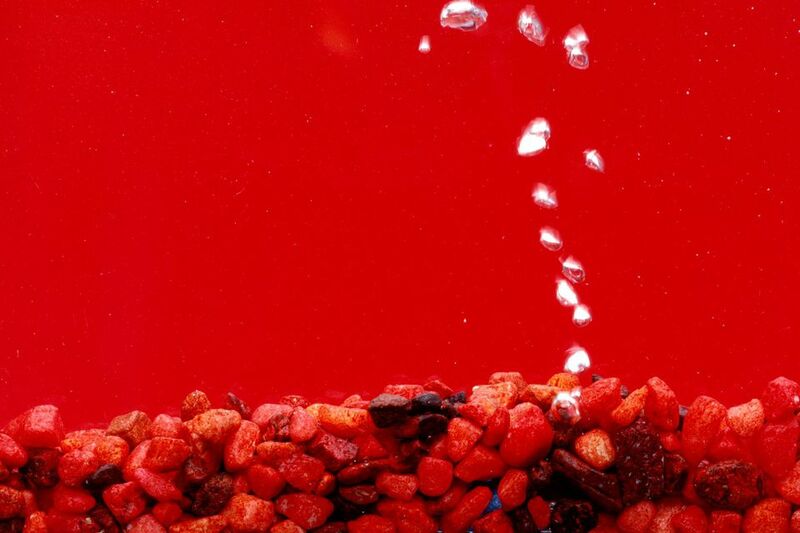 For crushed coral or course grain substrates, most often used in fish-only or fish-only with live rock aquariums, a light cleaning can be performed with a siphoning tool. For small to very fine grain sand bed substrates, typically chosen for reef tanks, siphon cleaning is not advised. With this method of cleaning the consistency of the media is so light that much of it as well as a tiny beneficial food source and sand sifting animals are removed, and it destroys the burrows of sand-dwelling fishes and invertebrates. The best way to tidy up an aquarium with this type of medium is to lightly ruffle or stir up the bottom with your fingers, a turkey baster or whatever tool you want to use to loosen up organics, which is then freed to be filtered out of the aquarium by means of the filtration system. Adding Extra Mechanical Filtration Tip: What's the easiest way to add extra mechanical filtration to faster remove the particulate matter suspended in the water while performing a cleaning task? Simply attach and run a compact canister filter during and several hours after the process. We use a Marineland Magnum 350 for this job. Removing organic debris from the live rock is simple. Just use a turkey baster or a small powerhead to shoot water all around and into the rocks to dislodge trapped material. Settled Sediment Clean Up Tip: During the process of any aquarium cleaning task, a certain amount of sand and sediment will resettle to the bottom. The easiest way to remove the fine layer of debris that can cover everything in the tank is to wait a little while and allow it settle, and then just "dust it off" with the turkey baster or powerhead. Depending on how much debris settles, you may need to repeat this process a couple of times. Overfeeding is a great contributor to the build-up of excess organics in aquariums. Feed fishes only what they will consume in a few minutes time, target feed sessile invertebrates that require this type of feeding, and remove any uneaten foods that you can see drifting around in the aquarium within a reasonable amount of time after each feeding. If you are concerned that your tank inhabitants may not be getting enough food, provide them with three or four more sparing feedings instead of two over-plentiful ones. If they are conducive to your kind of fish community and system, add a variety of tank janitors to your aquarium to help keep it clean.